1. Stick with the important facts and keep it short and to the point. I know that’s hard for politicians, but that’s what media want. 2. Get rid of all pithy quotes and remarks, all self-laudatory praise, any tedious, boring and useless blather, and anything you can’t prove with the facts. Nail it with style, using the smallest tool needed every time. 3. Tackle controversy head on, state your position distinctively and with precision, but avoid partisan platform brown bag advocacy, being pedantic, winey, or argumentative. Express passion and emotion when it is called for, but don’t go overboard and rant and rave. Be aware for your previous positions and explain the reasons for any change of heart, position or direction. 4. Indicate the vehicles for people to send comments, express their opinion and to provide feedback and the express an active and sincere willingness to listen to the people. You may find that funny and scary, but it really does impress people. 5. Offer media what they need to do their job (factual validation, photos, Q & A’s, interview opportunities, and visual aids). Make it fit the format of the media you are working with and make it unique for them. 6. Offer media easy access to the people that matter but not intermediaries or to people who don’t matter. Make it easy not hard to do interviews and schedule news conferences frequently. Give media the lead time they need to schedule and deploy the resources needed to give you what you want. Media coverage is valuable so use it wisely and get good at it. 7. Target the media who matter. Identify the people who will be interested and affected and pitch and feed to the media that they watch, read or listen. How do you find the right media? 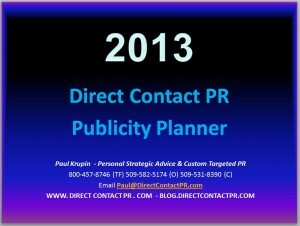 Since I’m a publicist, I use a licensed media database to do this and I create custom lists for client outreach efforts.